If you are in a passenger vehicle and you get in an accident with a large commercial truck, it can be much more dangerous and devastating than if you had just gotten into an accident with a vehicle the same size as your own. In 2015, over 4,300 large trucks and buses were involved in fatal crashes. If you tangle with a large commercial truck, you are likely to come out on the short end of the stick, as they say. Below we discuss the three leading causes of trucking accidents and what you can look for to help yourself avoid a catastrophic situation. The leading cause of large trucking accidents is driver error. There are many errors a driver can make while on the road that can lead to a deadly crash. One is being too tired. If you are operating a vehicle that can weigh upwards of 80,000 pounds, you have to be alert and focused at all times. Any sort of fatigue that can affect your ability to drive must be avoided and large commercial truck drivers have to make sure they get enough rest. After all, if they don’t, they are endangering the life of every driver and passenger in their vicinity. Another error that can be made by truck drivers is getting distracted. Just like drivers of passenger vehicles, truck drivers need to stay off their phones and leave the radio alone. But in the case of truck drivers, if they don’t heed this advice they can do a lot more damage than someone in a car. Driver error also means on the part of passenger vehicle drivers, who often cut off big trucks or drive in the blind spot of the truck, where the big rig driver can’t see them. If you drive a passenger vehicle, be on the lookout for trucks that are swerving or otherwise behaving erratically and make sure you stay out of their way. A large truck that isn’t properly maintained is an accident looking for a place to happen. Properly maintained tires and brakes are essential if a big truck is going to stop or be able to avoid a collision in time. Things like properly working lights can also help the driver of a passenger vehicle see a large truck in the dark. Even if a truck driver has the best maintenance habits, things can still fail on a truck. A blown tire, punctured by some sort of debris in the road, a trailer coming loose from the tractor hauling it, even something as simple as a blown turn signal light can spell doom on the roadways. 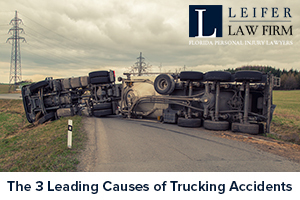 If you have been in a large trucking accident, contact the experienced truck accident attorneys at Leifer Law Firm for a free consultation. What Are Wide Turn Truck Accidents?